Perhaps the name was lost in translation during its trip across the Atlantic? 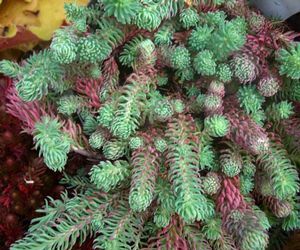 The bluish-gray 6” tall foliage has a feathery texture and reddish leaf tips, sporting yellow flowers in mid-summer. Drought resistance and hardiness make this a good choice for the rock garden or rooftop.